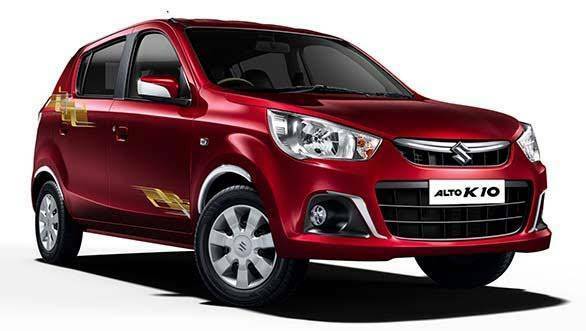 In a bid to combat new competition in the market, Maruti Suzuki has made a few nips and tucks to the Alto K10 and released a limited edition of the popular hatchback. The Alto K10 Urbano gets a few visual changes on the outside and has been fitted with additional equipment on the inside. It will be available across all trims - the Lx, Lxi, Vx, Vxi, Vxi(o) and the CNG - at around Rs 17,000 over the regular Alto K10. Prices start at Rs 3.23 lakh (ex-Delhi) for the base Lx variant. The Alto K10 Urbano can be distinguished from the regular variant through the stickering on the front and rear door panels along with chrome garnish on the ORVM, wheel arches, tail lights and fog lamps. Additional features inside include hands-free Bluetooth kit, new bucket seats with freshly designed leather covers and matching steering wheel cover, new mats, pedals, USB charger with voltage and temperature display and LED door sill guards. The Alto K10 Urbano also gets reverse parking sensors but driver/passenger airbags are still missing. R S Kalsi, executive director, Marketing & Sales, Maruti Suzuki India said, "The Urbano comes with characteristic black and silver theme with complementary body graphics and garnish. Several features like reverse parking sensor, hands free Bluetooth kit, fast USB car charger etc, bring delight and convenience to the customer. These features make Alto K10 Urbano more stylish and trendy. We are confident that customers will appreciate this limited edition." Maruti Suzuki will continue to offer this edition with the familiar 1-litre 998cc three-cylinder K10 engine producing 68PS of power and 90Nm of torque.